The EverQuest RPG is a pen-and-paper role-playing game based upon the successful EverQuest massively-multiplayer online role-playing games. 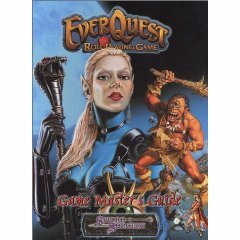 White Wolf secured the rights to use to popular EverQuest brand, and began publishing the game in 2002 through their Sword & Sorcery Studios (which, somewhat ironically, also publishes the World of Warcraft pen-and-paper game). Though many of the original books are no longer being published, they are still fairly easy to find as downloads or in the used market. The original release used the Open Game License rules from Wizards of the Coast, but not the d20 System Trademark. This means that there are just enough minor deviations to require some converting between EverQuest rules and 3rd Edition Dungeons and Dragons (or any other d20 game). The release of the EverQuest II Player’s guide deepened this translation divide, but no RPG player will have much difficulty adjusting to EverQuest rules. Essentially, this is d20 gaming for those players who are still fond of Norrath’s environment, history, and denizens (Froglok fans unite!). If you want to bring the EverQuest feel to your tabletop gaming group, this is a perfect way to unite the two worlds. However, the game is not merely a fix for EverCrack addicts; a number of players have stated their appreciation for EverQuest RPG’s unique handling of crafting and magic, with some even professing to prefer it to D&D. Though the races and classes tend to be more limiting (or even unbalanced), details such as those concerning spells and monsters will help win over even the most anti-EQ RPG-er. A person can literally spend hundreds of hours building a character in this world. There are endless missions & game play options. Since it’s creation this game has continuously been one of the most played games in existence. Countless creatures can be destroyed on your way to building the perfect character. You can join with others to form groups for even more fun. While on group missions it is helpful to have a variety of players with different skills in order to create the largest possible advantage that you & your team will be successful. It is great because when new expansions are released they allow you to grow your character in untold new ways while you explore whole new territories with new character types involve in the story line. If you have never played it is not necessary to understand all of the mythology involved in the additional expansion packs to jump in & start having fun. Just give it a shot. There are untold lands waiting to be explored & in some cases conquered by you & your team of experts companions.